Rosemary Conley offers you 4 great ways to lose weight - At a Slimming club, slim online, slim by post or slim with the best selling Food and Fitness magazine. Plus diet books, fitness dvd's, cookware and recipes. Offer condition: The voucher code is only valid until the 30th November 2014 and can only be used on annual membership purchases. Simply choose option 3 and enter the offer code at checkout. Do not miss another Rosemary Conley Online voucher! Simply leave your e-mail address and we'll always keep you informed of new vouchers for Rosemary Conley Online. Offer condition: October offers: £10 discount on Rosemary Conley moisturising and firming cream, save £18.50 of our 28 day premium food box RSP £184.99 includes free postage and packing, save 50% when you purchase 1 month's memership to Rosemaryconleyonline - this is only open to new members. Just quote code to receive the discount. Offer condition: Offer valid only when you place an order for one of the boxes from the Rosemary Conley 14-day food box range. Offer condition: Not to be used in conjunction with any other offer. New members only. Offer condition: Not to be used in conjunction with any other offer. New members only. Valid on 1 month membership only. Offer condition: Offer valid only when you place an order for the 28-Day Work Life Balance Food Box. Offer condition: Not to be used in conjunction with any other offer. New members only. Valid on 12 week membership only. Offer condition: Free Rosemary Conley moisturising firming cream with the Facial Flex Ultra if you quote offer code. Offer condition: Not to be used in conjunction with any other offer. 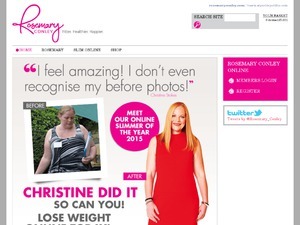 Offer condition: Lose weight online - 50% off rosemaryconleyonline if you quote offer code AF503. Not to be used in conjunction with any other offer. New members only. Valid on 12 week membership only. Latest voucher code valid at a time of promo publication was entered to be working from 2014-11-06.